Today, Britain’s Jewish community has an effective defence organisation – the Community Security Trust – which recognises that fascist organisations pose a genuine threat. However, this has not always been the case. In the first of two articles Steve Silver looks at the Jewish community’s response to fascist activities before and during the Second World War. Many Jews actively opposed the Olympia meeting; in fact as early as 1933 fights had been occurring between fascist newspaper sellers and Jews. 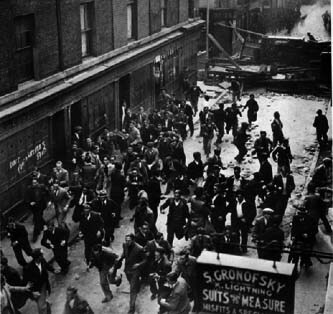 The BUF’s antisemitism had led to a campaign of violence against the Jews of East London, which caused so much concern that in June 1936 the Jewish Chronicle claimed that letters were “pouring” in on the issue of antisemitism in Britain, and the best way to deal with the problem. There were different views expressed but the most common were: that the Jewish community needed to create an independent defence organisation; that this need was urgent; and that this organisation should cooperate with other anti-fascist organisations. The increased threat of antisemitism and the demands from the Jewish community, publicly aired in the pages of the Jewish Chronicle, for more organised communal defence saw two organisations formed in the summer of 1936, both committed to the defence of the Jewish community. The first was under the auspices of the Jewish establishment, the Board of Deputies of British Jews (BoD), and the other was controlled by the working-class Jewish left; these organisations had very different approaches to the problem. At the same time as the Board organised its defence structure, left-wing anti-fascists formed their own defence organisation. In July 1936 a conference was convened by the Jewish Labour Council from which emerged the Jewish People’s Council Against Fascism and Anti-semitism (JPC). What distinguished the JPC from the Board was that the JPC believed the fight against antisemitism was inseparable from the fight against fascism, while the Board, in an effort to maintain political impartiality, was reluctant to come out against fascism per se. The JPC held mass meetings, distributed leaflets and published its own monthly newsletter, Vigilance, which was distributed by several branches across London. The JPC worked with non-Jewish anti-fascist organisations and had a particularly close relationship with the National Council for Civil Liberties, with which it organised a joint conference in 1937. The JPC called for the banning of political uniforms and for incitement to racial hatred to be made illegal. It also organised deputations to local council leaders and to the Home Office protesting against fascist provocation. While individual members of the CPGB were certainly prominent in its leadership (the secretary was Jack Pearce and the editor of Vigilance was Issie Pushkin, both communists), it appears to have operated independently of the party. The activities of the JPC infuriated the Board to such an extent that the Board appealed to Jewish organisations to boycott it, and to the BBC and The Times to desist from giving it publicity. For good measure the Board wrote to the Home Office claiming that the JPC had no support from responsible Jews. The summer of 1936 saw hundreds of East London youths join local Blackshirt thugs in attacking the local Jewish population. The BUF decided to make a show of strength to capitalise on the antisemitic campaign by holding a march through the Jewish districts of East London. On 4 October 1936, seven thousand Blackshirts assembled at Tower Hill from where they planned to march through East London. While the JPC, the CPGB, and the Independent Labour Party called for a mass anti-fascist mobilisation, the BoD, the Labour Party, the Jewish Chronicle, the Daily Herald and the News Chronicle all appealed to people to stay away. Their appeals were ignored. In the best known anti-fascist mobilisation in British history, the BUF’s intended march was stopped at Cable Street. It was the JPC and the CPGB that organised the blockade of the fascist route. Estimates of the antifascist numbers vary from 100,000 to half a million. Catholics and Jews worked together, tearing up paving stones and erecting barricades to block the streets. Despite their large-scale mobilisation, the police were unable to clear a path through East London for the BUF, heralding a great victory for the anti-fascists. Even though for anti-fascists 4 October was an undoubted success, and perhaps partly because of it, the violence that the Blackshirts had been perpetrating against the Jewish community continued unabated. The government’s response to the disturbances was to introduce a Public Order Act. The BoD welcomed the Act, but it was quickly to become clear that the Act was not going to offer enough protection to the Jewish community. The brutality of stewards in dealing with opposition at a BUF meeting in Hornsey in January 1937 caused the communal leadership to take a more sober view of the bill. There were open-air meetings where BUF speakers gave inflammatory, antisemitic speeches in front of police note takers. It was this developing lack of confidence in the forces of law and order that led the Jewish Chronicle to enquire whether the Public Order Act was a “working reality or a pathetic illusion”. However, things were not going all the fascists’ way either. Oswald Mosley, the leader of the BUF, began to receive less and less press coverage. At the same time the organisation found it increasingly difficult to obtain venues for meetings as it had become increasingly associated with violence. A split from the BUF in 1937 when two leading members, William Joyce and John Beckett, formed the National Socialist League further compounded Mosley’s political difficulties. Then, in October 1938, Beckett broke away from the National Socialist League to form the British People’s Party. By 1938, under the weight of the antisemitic campaign, the BoD came round to the view that fascism had to be fought as well as antisemitism. Recognising this, the JPC’s management committee gave a mandate in April 1938 to its representatives to work for the merger of the JPC with the Board’s defence structure. The Board had not, however, rescinded its opposition to physical confrontation. Despite several attempts, neither the Board nor the JPC could persuade their members to accept unification of the two bodies. Some Board members were concerned by the left-wing orientation of the JPC, and the JPC members were concerned that its organisation would lose its identity and principles by merging with the Board. Nevertheless, although formal unification was not achieved there was a regular exchange of speakers and literature. The rise of Nazism and the consequent Jewish refugee problem, coupled with the BoD’s perceived weak stand against antisemitism, and the government’s inaction on all counts, produced two beneficiaries: Zionism and communism. While the older generation of communal leaders tended to argue that British Jews were a religious minority but nevertheless very much British, Zionism offered the opportunity for Jews to express a separate ethnic identity, independent of religion. Zionism stood in stark contrast to the assimilationism of the older communal leadership. During the late 1930s Jewish communal leadership was transferred from the older Anglicised and established leadership to a newer group of middleclass first and second generation immigrants, and Zionism provided the vehicle for that change. While the Zionists took formal control of the Board, among the Jewish masses of London communism was to make huge inroads during the war, building on the support that the CPGB had gained from the leading role it had played in the anti-fascist movement before the war. Piratin argued: “When the war broke out the Communist Party was the only political organisation in Stepney to maintain its activity”. Even though much has been made of the Nazi-Soviet pact of 1939, it did little in the long term to damage the CPGB’s standing among the Jewish masses. Support for the Soviet Union reached a high among the wider British population when it became an ally against Nazi Germany. This was even stronger among the Jewish population; meetings were held to raise money for various Soviet causes and support came from across the political and class spectrum. Former anti-communists seemed happy to raise funds for the Soviet war effort. The most notable organisation was the Jewish Fund for Soviet Russia (JFSR), which, while run by communists, was supported by leading figures and organisations in the Jewish community, including the Chief Rabbi, Rabbi Hertz. The internment of some British fascists after May 1940 had not brought about the end of fascist activity in Britain. Aside from traitors, some well known such as William Joyce (Lord Haw Haw) who carried out radio broadcasts for the Nazis from Germany, the fascists also strove to keep their organisations alive during the war. There were several organisations devoted to this task, the most important being the 18b Detainees Aid Fund, which acted as a welfare organisation for former Blackshirts. Mosley was released on medical grounds from Brixton Prison in November 1943. Imprisonment and revelations of fascist atrocities had not made him in the slightest bit repentant. His release caused outrage among anti-fascists; there were at least 21 anti-Mosley meetings in the month following his release, some very large. The Police Special Branch argued that these meetings were mainly planned by the CPGB or its “front organisations”. Communists continued to campaign against fascism and antisemitism during the war. The CPGB made much of the resurgence of fascist activity in 1943 focussed around H W S Russell, the twelfth Duke of Bedford, and the British National Party. At a large CPGB-organised, open-air meeting in Lincoln’s Inn Fields, Maurice Orbach, from the BoD, and Piratin shared a platform. The antifascist campaign resulted in the disbandment of the BNP. It was during this period that a group of Jewish CPGB businessmen formed the Businessmen’s Forum. One of their most important tasks was to raise support for Piratin, who was standing as the CPGB candidate for the largely Jewish district of Mile End in the 1945 general election. There was a considerable overlap of members between the Forum and the London section of the CPGB’s National Jewish Committee (LJC). The minutes of one LJC meeting reported that “two comrades [are] to be sent to E. London for three months for the purpose of rallying the Party there to Jewish work”. “Jewish work” had become the generally used term for communist activity among Jews, and the two comrades were Jack Perry and Essex. Essex became Piratin’s campaign manager for the general election some eight months later. “Jew and Gentile in Stepney have learned the value of standing and fighting together. Before the war, it was against the landlords and against Mosley Fascism. During the war it was against enemy bombing and for the protection of our neighbours. We are convinced that we can build a new Britain and a new Stepney where people can live happily and harmoniously together. In the July 1945 general election, the wartime growth in support for the CPGB among the Jewish community was confirmed at the ballot box when Piratin was returned as the member for Mile End, one of two Communist MPs, in a huge Labour landslide victory (the other Communist MP was Willie Gallacher, who held on to his West Fife seat). Piratin made the only Communist breakthrough, securing 47.6 per cent of the vote. The CPGB’s work in the Jewish community reaped further benefits four months later when 10 communists were elected to the Stepney Borough Council, seven of whom were Jewish. The end of the war signalled other changes beyond the ideological. In Palestine, political and military instability; in Britain, fascists had been released and soldiers were being demobilised. Sixty thousand Jewish men and women had served in the armed forces. For anti-fascists the war had started before 1939 and while, for many, coming home signalled the end of the fight against fascism, for others the fight was to continue. In December 1945 Mosley declared from his mansion in Wiltshire: “I have not changed my political ideas one iota. I do not retract anything I have either said or stood for in the past.” Nevertheless, the political climate was not ripe for Mosley’s immediate return to politics. The ground needed to be laid and supporters needed to be reactivated. “Book clubs” and “discussion groups” were set up across the country by former BUF members, the eventual intention being their merger with other fascist organisations into a new fascist party, the successor to the BUF. There were also groups that organised the more conventional fascist meetings, the most notable being the revived British People’s Party and Jeffrey Hamm’s League of Ex-Servicemen and Women. While one might assume that the fascists would be unlikely to gain a hearing so shortly after a war fought against a fascist axis, there were two key factors that helped oil the wheels of a revival. Firstly, antisemitism among the general population had increased during the war as a result of anti-Jewish agitation. Secondly, this antisemitism was given an unprecedented boost by the reporting in Britain of the activities of the Jewish underground in Palestine, most notably those of the extreme right-wing splinter organisations, the Irgun Zvai Leumi and the Stern Gang. As the fascists became active again, among Britain’s Jews the old question of how to deal with antisemitism was revived. Jewish ex-servicemen spoke at open-air meetings, organised by the Association of Jewish Ex-Servicemen (AJEX), denouncing antisemitism and fascism. Even though the leadership of the Board had changed, the new Zionist leadership pursued a similar approach to defence as before the war. This laid the ground for a revival of the prewar defence debate. The changes in the political climate meant that there were different protagonists this time. This time it was the Board leadership under the control of moderate Zionists, versus both communists and militant – often younger – Zionists. Communists and militant Zionists found that their views converged on the issues of both fascism and Palestine. These latter Zionists, most of whom had served in the armed forces, were determined to shatter the antisemitic stereotype of the weak, cowardly Jew. They were determined to fight antisemitism at home and actively support the creation of a Jewish state in Palestine. For Jewish CPGB members the fight against fascism continued to be central but they were also keen to see Britain lose control of Palestine. This served the dual purpose of ridding the region of British imperialism and providing a home for the thousands of Jewish refugees who were stateless and living in displaced persons’ camps. It was in this political climate that Jewish ex-servicemen heckled and on occasions attacked fascist meetings at the end of the war. Realising that the BoD could not be seen to be encouraging Jews to break the law, and that AJEX was not going to countenance such activities as the breaking up of fascist meetings, less than a year after the war’s end, some leading AJEX members broke away and formed their own organisation, the 43 Group. Next month: Steve Silver looks at the defence debate and the 43 Group (1946 –1950).